These easy no-bake oatmeal cookies are naturally vegan, gluten-free, dairy-free and 100% whole grain. Can be made as oatmeal raisin cookies or with chocolate chips. Thank you to Bob’s Red Mill for sponsoring today’s post! Check out more delicious healthy recipes, snag coupons and find stores near you at BobsRedMill.com. This recipe is adapted from my peanut no-bake butter cookies. I’ve gotten a few requests for no-bake cookies without peanut butter so here we go. I think these oatmeal cookies are even better! But I know it’s a personal preference. I just love oatmeal cookies so much. I first posted these whole wheat oatmeal cookies, then came up with a gluten-free oatmeal cookie recipe based on the whole wheat one, and finally – my paleo “oatmeal” cookies (with a vegan option)! They’ve all gotten rave reviews so if you prefer baked cookies over no-bake cookies, go check them out. Summer isn’t the easiest time of the year to keep your nutrition game strong. People are busy, it’s hot and I don’t know about you… but I really don’t feel like standing in front of a hot oven. I’ve actually been ovenless for the last month and these oatmeal no-bake cookies have been such a great treat to have on-hand! 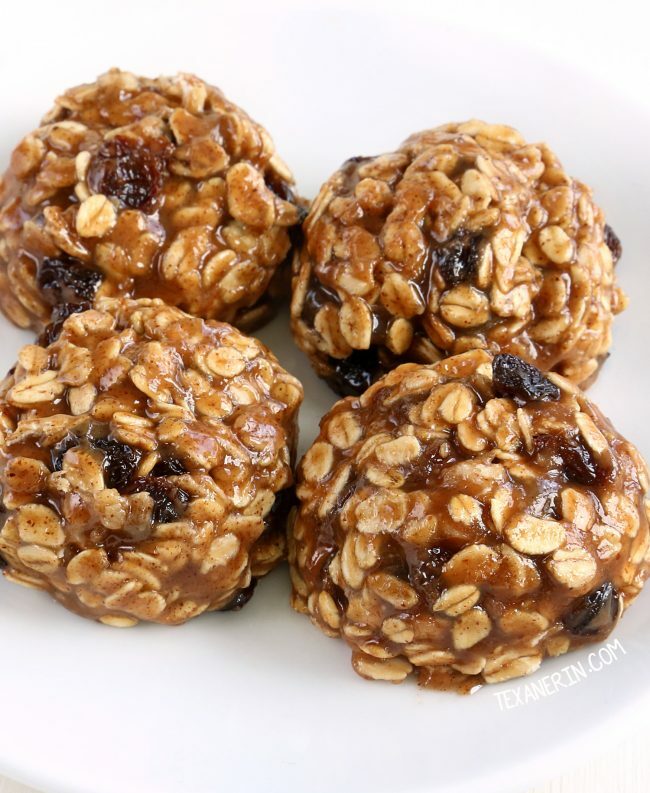 These no-bake oatmeal cookies are loaded with oats and almond butter, which add a nice nutritional boost. Compared to regular cookies, I think these are relatively healthy. And they’re great to pack in your bag for those busy summer days! If no-bake cookies aren’t your thing, here are some other great gluten-free cookies recipes you could try out! 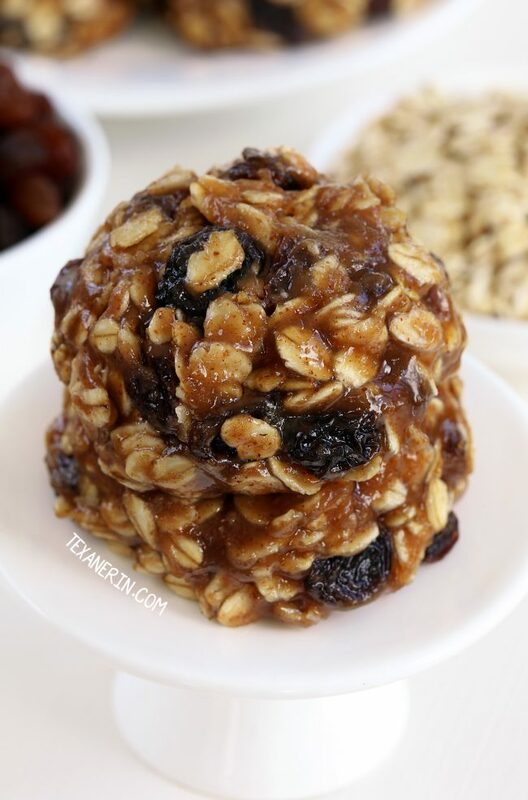 I use raisins, cinnamon and sometimes a little nutmeg in them for a no-bake oatmeal raisin cookie version, but if that’s not your thing, chocolate chips work, too! If you want to use those, let the mixture cool almost to room temperature so that the heat doesn’t melt all the chocolate chips. You could also scoop into cookies and then sprinkle the chocolate chips on top once the cookies have mostly cooled. These gluten-free no-bake cookies are maple sweetened but I’m sure some of you are wondering if you can use honey. Unfortunately, it’s a most definite no. I even put a warning in the video saying not to use it. :) First of all, it takes a lot longer to boil and the result is some not very tasty cookies with a totally different texture. Even after boiling for 10 (instead of 2 minutes), I didn’t get the slightly caramel-like mixture that you see in the picture. And then the cookies tasted overwhelmingly of honey! We didn’t enjoy those at all. I get so many comments on my Pinterest pins that say, “Oats aren’t gluten-free!! !” But they are. They’re naturally gluten-free but the problem is that they can get contaminated in the field or during production. So if you’re making these vegan no-bake cookies for someone who needs to eat gluten-free, make sure to buy gluten-free oats! I used Bob’s Red Mill Gluten-Free Organic Old-Fashioned Rolled Oats. 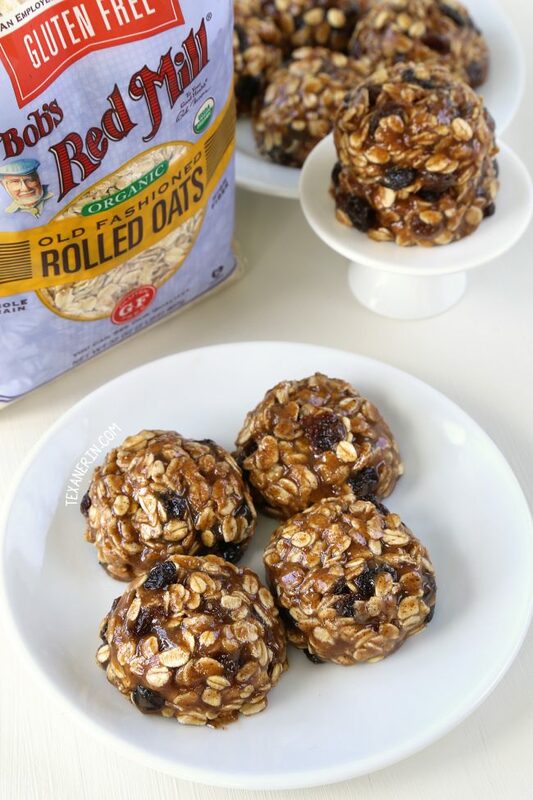 They’re handled in their dedicated gluten-free facility and like Bob’s Red Mill’s other gluten-free products, are tested in a lab to verify the gluten-free integrity of the oats. They also meet the strict requirements of the USDA’s Organic Program! If you only have quick oats, they work here, but the result is pretty different. They had more of a protein ball or no-bake soft granola bar texture. I actually made a batch with quick oats to take pictures to show you how different they look… but I ate them all before it was light enough to take pictures. Whoops. They were still delicious! Just different. Do note, though, that a small percentage of people who can’t eat gluten also can’t eat non-contaminated oats due to a protein in oats called avenin, which is similar to gluten. If making something with oats for a gluten-free friend, it’s probably a good idea to ask if they’re okay with oats (and actually, I’d probably run the entire ingredient list by them! Gluten is lurking in all kinds of things you wouldn’t suspect). Thanks again to Bob’s Red Mill for sponsoring today’s recipe! Be sure to check out their recipe section for more goodies made with their gluten-free oats, like this gluten-free cherry crumb pie. It sounds SO good! See the notes below for the chocolate chip version! In a medium pot, stir together the coconut oil, almond butter, maple syrup and salt. Turn the heat to low and stir occasionally until the coconut oil is melted. If your coconut oil has been chilled or is very hard, melt the coconut oil in the pot before adding the other ingredients. Turn the heat up to medium, and while stirring constantly, bring the mixture to a full boil. Boil for 2 minutes, stirring constantly and adjusting the heat as necessary (you might want to turn it down a little). The mixture should become glossy. Don't boil it longer or it may separate. Remove from the heat and stir in the vanilla, cinnamon and nutmeg and stir. Stir in the oats and raisins until well combined. Use a medium cookie scoop to scoop out balls of the mixture onto a piece of parchment paper. They'll firm up after a few hours at room temperature (provided your home isn't super warm) or you can chill them to firm them up quicker. Store in an airtight container for up to 3 days. They can also be refrigerated for up to about a week. For firmer cookies, refrigerate them. If you want to take these out as an on-the-go snack and it's especially warm, you'll probably want to refrigerate them first. I've tried these several times with honey and the texture comes out totally different and not in a good way. The cookies also taste overwhelmingly of honey. Whether brown rice syrup, agave or other liquid sweeteners works, I don't know as I haven't tried them. Granulated sweeteners will not work. For a chocolate chip version, omit the cinnamon, nutmeg and raisins. Once everything is mixed together, let it cool almost to room temperature so that the heat won't melt the chocolate chips. Stir in the chocolate chips. You could also form them into cookie shape and then sprinkle the chocolate chips on top once the cookies have mostly cooled. 37 comments on “No-bake Oatmeal Cookies (vegan, gluten-free, dairy-free, whole grain)” — Add one! The photos look appetizing. 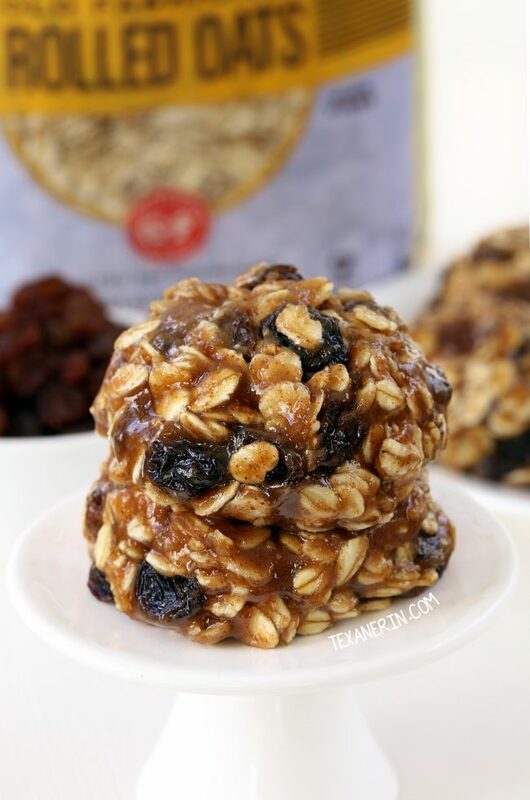 Thanks for sharing your recipe for the easy no-bake oatmeal cookies. I like that it’s naturally vegan, gluten-free, dairy-free and 100% whole grain. But I’m quite worried whether this is something I can actually eat. I feel like it is too sweet and will cause my blood glucose to rise. But if not, I would definitely give this a try. Do you have the nutrition value figured out for these cookies as you made them, with the almond butter, etc? Would these be okay to freeze? Do you think the recipe would still work if I omit any sweetener? It would unfortunately most definitely not work. Sorry about that! In lieu of regular nut or seed butter, I used 1/2 cup of powdered peanut butter (PB2), which removes 85% of the fat. The instructions use 1 part water to 2 parts powdered pb, so I added 1/4 a cup of water. I used 1/2 cup of honey and boiled all for 2 minutes. I added the chocolate chips the same time I added the oats because traditional no-bake cookies are essentially melted pb and chocolate heaven! So my chocolate chips melted right into all the mixture. I then scooped them out onto a tray with a silicone mat and froze them for 30 minutes. Haha. Well I’m happy you at least saw the disclaimers! I tried to put in enough so people wouldn’t attempt it (but it seems okay that it didn’t work on you ;)) That’s awesome that your PB2 and honey version worked out well! Did the honey mixture become caramel-y like you can see in the video? That was my issue with it. It boiled and boiled and boiled and it finally thickened, but all we could taste was honey. Thanks for your comment and the tips for anyone else wanting to use PB2! These are my kind of cookies! YUM! I want to pop one in my mouth right now! They look YUMMY! These look beautiful and congratulations!!! What a fantastic recipe! My kids and I are going make these today (with sunbutter instead of almond butter due to allergies). I will report back!! YUM! Oh, yay! I hope you’ll enjoy them. Can’t wait to hear how they work out with Sunbutter! Oh my gosh, I had no idea. Congratulations, Erin. I’m so happy for you. I love this recipe. I adore oatmeal cookies and just don’t make them enough. These look incredible. These look really great! I’m eager to make these this week. What a great treat when my sweet tooth calls! I hope that you’ll love them as much as we do! Congratulations!!!!!!!!!!! <3 I love the news and these cookies! These sound delicious and with the heatwave hitting us this week, the more I can avoid the oven the better! Right?! Too hot to bake! I love when I can keep my oven off to make cookies! Congrats! Being pregnant AND moving are two major things so kudos to you for being able to post anything but I’m so glad you did because they look so yummy! Haha. Well my posting of new recipes has been really infrequent for the last 6 months but at least I have these cookies. :D Thanks so much! WOW!!! A big CONGRATULATIONS to both of you. You are good at keeping secrets. HA!! 2 secrets actually. HA! These cookies look pretty tasty. Thanks so much, Charlotte! I guess I am a pretty good secret keeper. ;) Hope you get to try the cookies out! Hi, sounds like a great recipe but one question: I’ve read several articles about coconut oil and my doctor expressed the same opinion that is largely saturated fat and not at all healthy despite all the recent hoopla about it.